Delhi, the National Capital loves pollution and won’t let it go away. Pollution in Delhi is here to stay and Delhiites cannot be more ignorant. That time is not far when clean breathable air will be sold just like bottled water. But what are the causes of this rapid growth of Pollution in Delhi? Major air pollution in Delhi NCR is comprised of a mix of pollution from human activities such as vehicle emissions, residential fuel burning, smoking etc. The heavy concentration of particulate matter is greatly affected by meteorological conditions –in the winter, cool air causes “inversions” that stagnates the air and trap pollution close to the ground. Air flow patterns from Afghanistan and Pakistan pick up emissions as they move over the densely urbanized regions of Punjab and Haryana where farmers burn the straw in their fields and push this pollution into Delhi. Pre-monsoon dust storms also contribute to air pollution in the region. The Environment Pollution (Prevention & Control) Authority investigated the issue and reported to the Supreme Court the significant role of vehicles and vehicle emissions in rising air pollution in Delhi, stating that rapid motorization based on poor quality fuel and vehicle technology will make the air pollution trend irreversible. New Delhi is the 11th most polluted city in the world, with an annual average PM2.5 measurement of 122. PM2.5 levels have been rising in the city over the past five years. In some areas such as Pitampura in north delhi, PM2.5 levels increased from 60 in 2011 to 119 in 2015, yearly data from the country’s Pollution Control Board shows. 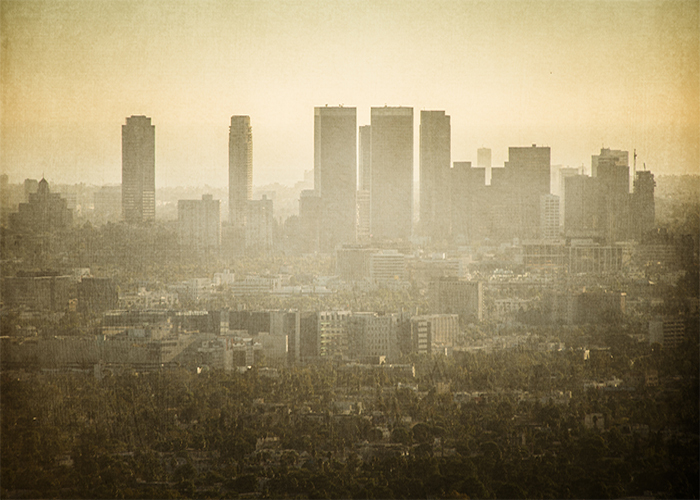 The World Health Organization recommends that PM2.5 is kept below 10 as an annual average. It says exposure to average annual concentrations of PM2.5 of 35 or above is associated with a 15% higher long-term mortality risk. “No matter how adverse the meteorological conditions are, a high concentration of PM2.5 can’t occur without multiple sources of emissions,” said Sumit Sharma, a fellow at Earth Sciences and Climate Change Division of the Delhi-based Energy and Research Institute who has been studying air pollution in India. The problem which has engulfed the City is not new. It may have taken an unprecedented form, but it is not unforeseen. 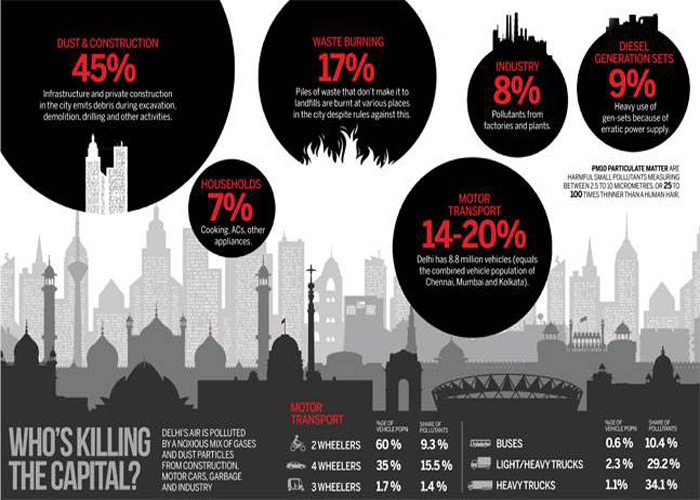 Though, the air of Delhi remains polluted throughout the year, the worst time comes after Diwali. There are a lot of fireworks in Diwali. Weather starts changing and cold season starts with it. During summer and rain, the speed of wind is high and even sun rays are hot and hence nature keeps on purifying the polluted air, but with the onset of winter, not only sun rays lose its heat, even the speed of wind decreases and the pollutants stabilize in the air. With each passing day, the quality of air gets worse. This is repeated each year without fail and all of us including our policymakers are aware of it. We all are aware about the causes and also aware how the issues can be addressed, but we never address them. Take the example of vehicular pollution. Vehicles are one of the measure sources of pollution in Delhi. Some measures have been taken to address the problems caused by vehicular pollution. Public buses have been turned into CNG buses. Diesel engines are being discouraged. Many trucks running with diesel engines and passing through the capital has been subjected to many kinds of restrictions. Even court has intervened to control the pollution caused by vehicles. Diwali does contribute to pollution, because of its timing. In schools, children are instructed not to use crackers in Diwali. Even administrators put some restrictions on the sale of crackers, so that crackers with more smoke are not used. But the question is why crackers cannot be banned during festivities of Diwali? Traditionally, Diwali is considered the festival of light and not of crackers. The history of using crackers on Diwali is not much old. The arrival of Gun Powder in India is hardly 500 years old, but we are celebrating Diwali for thousands of years. Hence, if crackers and other fireworks are banned, no one can complain that it hurts his religious sentiments (But they actually do complain). Farmers of Punjab and Haryana burn the leftovers of paddy crops almost at the same time to clear their fields for Rabbi Crops. The smoke emanating from the burning causes pollution too. The pollution is caused even where the paddy straws are burnt, but once the smoke reaches Delhi, it combined there with other pollutants and makes the life of Delhites hell. Punjab and Haryana High Court has banned that practice and there is provision of punishment and penalty for such kind of burning, but despite all these farmers burn the stubble. The government should deal this issue tactfully and provide alternative to the straw burning. This kind of burning even affects the fertility of the land. The pollution cover over Delhi and adjoining areas are man-made and ultimate responsibility for it lies on our policy makers. They must take responsibility for it. Modi government has launched a campaign for clean India. How can this objective be achieved if our air is dirty? Every great city has its great joys and sorrows. So Delhi, a radial melting pot of cultures that has history at every corner, greenery on every sidewalk, and changes clothes and colours with the seasons, has been plagued with debilitating concerns over women’s safety, and with something noxious, deleterious, downright nasty, in the air. A Delhi resident is today exposed to an average of 153 micrograms per cubic metre of PM 2.5-the smallest and most harmful of all measurable particulate matter-which is 15 times higher than the WHO’s recommended annual average. And while this data may seem too obscure to raise alarm bells, and the effects of pollution too insidious to rattle the cage, disease and death is looming. Preying first on the most vulnerable-children, seniors, those with respiratory disorders-and slowly devouring even the most healthy. The stench of smoke, burning of the eyes, smoggy mornings, hazy nights, are all symptoms of a deeper malaise. Doctors associate high levels of suspended particulate matter and sulphur dioxide with increased mortality, morbidity and impaired pulmonary function. They say that fine particulates penetrate the respiratory system, and can alter the immune system, impair the liver and the kidney, and cause brain damage in children resulting in lower IQ, hyperactivity and lower concentration. The rise in carbon monoxide levels affects the cardiovascular system, particularly among children, and can attack the nervous system. 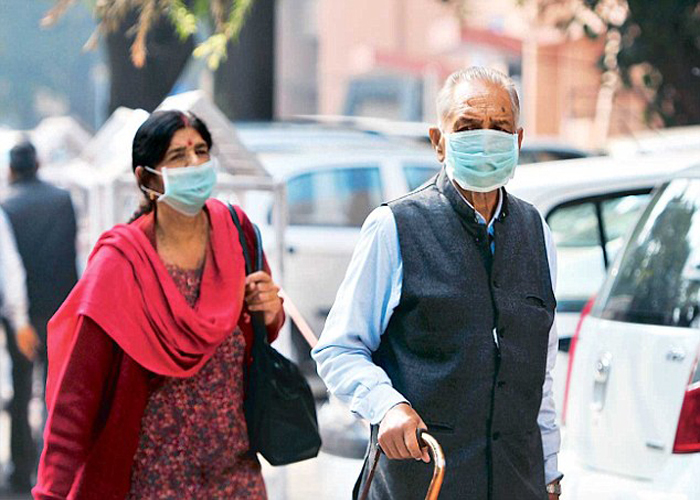 Two studies endorsed by the Central Pollution Control Board (CPCB) in 2012 said that one in five adults and one in four children in Delhi suffered from upper respiratory diseases, and that these numbers were on an upward trend. The first step towards understanding Delhi’s particular pollution problem is to understand the city-its aspirations, and its design. Delhi is primarily a network of localities, or a conglomerate of villages, linked by roads that intersect, bifurcate and overlap, like spaghetti in a bowl. It’s a series of concentric circles with numerous entry and exit points, and has almost no dedicated commercial centre, and no clear housing pattern. Its population is growing at an alarming rate, having nearly doubled from 10 million to 20 million in the last two decades. And new satellite towns such as Gurgaon and Noida, which now form an ominous National Capital Region because of seamless urban integration, are also as commercial as they are residential. 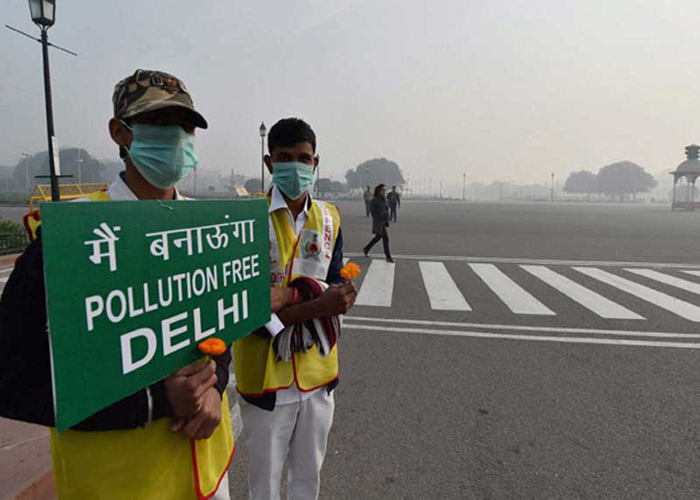 Over the last year, the CPCB has started taking its monitoring role more seriously by setting up a real-time system to measure Air Quality Index (AQI) across eight pollutants in 11 cities. The aim is to make AQIs available for 22 state capitals and 44 other cities with a population exceeding one million. But it’s too little, too late. In all of Delhi’s seven monitoring centres, AQI readings have routinely breached 300 this December-anything above that is considered hazardous-and crossed 600 regularly at Anand Vihar in east Delhi. The solution, suggests Rahul Mehrotra, is to think macro. 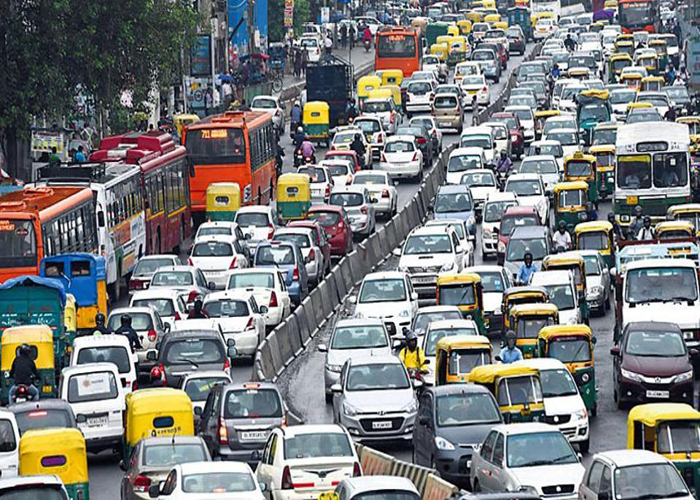 “Delhi needs imaginative inter-modal transport systems that link buses with metros, and taxis and autos with buses. You shouldn’t lose time and you shouldn’t have to walk more than a few metres to get to your next ride,” he says. Next, he asks for a transport system that is mindful of the relationship between where people live and where they work. “Land-use planning and transportation must go hand in hand. In fact it should be the only parameter.” And finally, using public transport to develop the city by offering cheap housing near new mass transit systems. It’s important for Delhi that this season of heightened awareness portends holistic changes; that it isn’t an example of intense fire-fighting, only to be forgotten once short-term solutions provide meagre gains. The era of ignorant optimism is over. So roll over P.B. Shelley and welcome to the grim new world of George R.R. Martin: Winter is coming; Spring may indeed be far behind. From carpooling to using public transport, from proper waste disposal to using cleaner energy sources, every little bit will make a difference. With increased awareness and self-implementation of atmosphere-friendly actions, a change is possible. On the personal front we can install air purifiers in our homes, office and cars so that we can breathe fresh air indoors. An air purifier or air cleaner is a device which removes contaminants from the air in a room. These devices are commonly marketed as being beneficial to allergy sufferers and asthmatics, and at reducing or eliminating second-hand tobacco smoke. 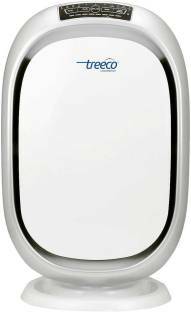 A wide range of air purifiers are available in the market today which will make the toxic air around you clean and breathable. Air purifiers effectively removes extra fine particles, 0.1 to 0.3 microns and creates allergy and asthma free environment. Most of the air purifiers are able to provide fresh air via 8 stages filtration system (Pre-filter, Electrostatic Dust Collector, VOC/ Formaldehyde Filter, Ozone Filter, Photocatalyst Sterilization and UV Disinfection). Their maintenance is easy and pocket friendly.